New Directions Education has always strived to work in partnership with our community. From offering an award-winning service to running our own awards and conferences. In 2017 we launched our New Directions Education Partnership Conferences to support schools and their senior management teams. These events were attended by over 400 delegates and were delivered free of charge. Our team facilitated sessions on mindfulness and wellbeing, data protection and leading behavioural change. The feedback from these sessions has been overwhelming, with one head teacher saying ‘Great conference. So in tune with the needs of schools. Professionalism, behaviour and mindfulness. Many thanks’. Gary Williams, Director of Business Development for our organisation tells us more about the many celebration events that our business has held to support the education community. 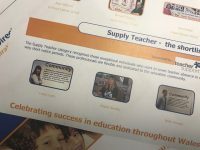 ‘In 2014 we re-launched our Inspirational Teaching Awards to celebrate all that the education fraternity across Wales delivers to our young people. We felt it was important to reward and recognise the hard work of the people who work the hardest across our classrooms. As well as recognising the permanent staff within the schools, we also had categories for our supply staff (pictured L-R Lesley Curtis (winner), Angela Sandles, Meilir Tecwyn). The event was an opportunity for the people we work with to come together and really witness achievement’. New Directions work to continually re-invest within our community, Gary adds ‘watch this space for an upcoming celebration for those staff that are at the very heart of what we deliver – our own supply team.